Here is the period French vocabulary: how to say to menstruate in French, feminine hygiene products + the strangest tradition + cultural notes about menstruating in France. In France, talking about one’s period (les règles) is not a common topic, even among women. I mean, if you suffer from terrible menstrual cramps, you may say to your friend you are not feeling well “je ne me sens pas très bien” (more about French medical vocabulary), or just use the typical “je suis indisposée” – I’m indisposed – and you’re friend will understand what is going on. Not too long ago, this subject was just plain taboo. Up to I’d say the Fifties, many women had no idea what was happening to them when they had their first period. No one told them what to expect. In my family, we were four girls plus my Mom. My Dad (who is an older gentleman) didn’t allow us to leave any feminine hygiene products in the toilet, not even hidden behind the stall. Can you imagine! Things have changed now, the conversation is no longer as taboo, and Frenchmen no longer react like my Dad (thank goodness!!). Yet, contrarily to my American girlfriends who often rave about their menstrual pains, I’ve never had a French friend complain in detail about her period. It may be old-fashioned, but French women tend to be discreet about this topic, which is considered too personal to share in France. No judgement from my part – I just thought you’d like to know. In anycase, it’s a tradition: not everybody does it, some people have never heard of it, but it’s not uncommon. My mom did it to me. I did it to my daughter Leyla. In my case, I did it because I wanted to mark the day. I never slap Leyla (I was actually not sure I was going to be able to do it!!). So I was absolutely sure to get her attention. First, she was a bit mad at me. Then when I explained why I did it, and that it was a tradition for her to realize it was an important day: that it marked the beginning of her womanhood, and that it was a big deal to me – and should be to her – she understood. And now, here is some useful French vocabulary about menstruation. 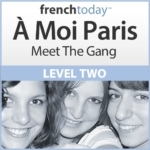 3 – How do you say Period in French? Period in French is “les règles”. It’s a feminine word, always used in the plural. 4 – How to you say To Menstruate in French? To menstruate in French is “avoir ses règles”. Sophie ne peut pas aller à la piscine, elle est indisposée. Sophie cannot go to the swimming pool, she is indisposed. I have no idea where this one comes from, but “ragnagnas” sounds like someone complaining, protesting… which women often do when they menstruate. So that would be my personal interpretation of the expression! This expressions translates as “The English have landed” (from a boat). So, what have the English in common with menstruating? Well, this dates back to Napoleon and the British army, then called the redcoats – Aha !! Désolée, je n’ai vraiment pas envie d’aller monter à cheval. Je ne me sens pas très bien… enfin, pour tout te dire, je suis indisposée… bref, j’ai mes ragnagnas, et je n’ai qu’une envie : rester au lit! Sorry, I really don’t feel like going horseback riding. I don’t feel very well… Well, to tell you everything, I’m indisposed… in other Code Red, and I just want one thing: stay in bed! All feminine hygiene products are easily available in France in supermarkets and pharmacies. How do you say “where is the bathroom” in French?